8. Turn off the stove. Don’t move anything. Keep the lid on. Don’t even touch it. Let the chicken have a good spa for 40 mins. If you want your chicken to be more tender, you can use less time. But that may means you will see blood in the chicken bone. I like to play the safe card. So I let the chicken be there for 40 mins. And by the way, my chicken is around 800g. Bigger chicken needs more time. 9. After a good sauna. Chicken will feel hot. Put it into icy cold water immediately. 10. Brush sesame oil onto it. Cut it. Don’t throw the chicken soup away. It’s ideal to make other soup or to boil dumplings/ wantons. The soup can be used to cook rice, ratio is 1 cup of rice to 1 cup of soup. 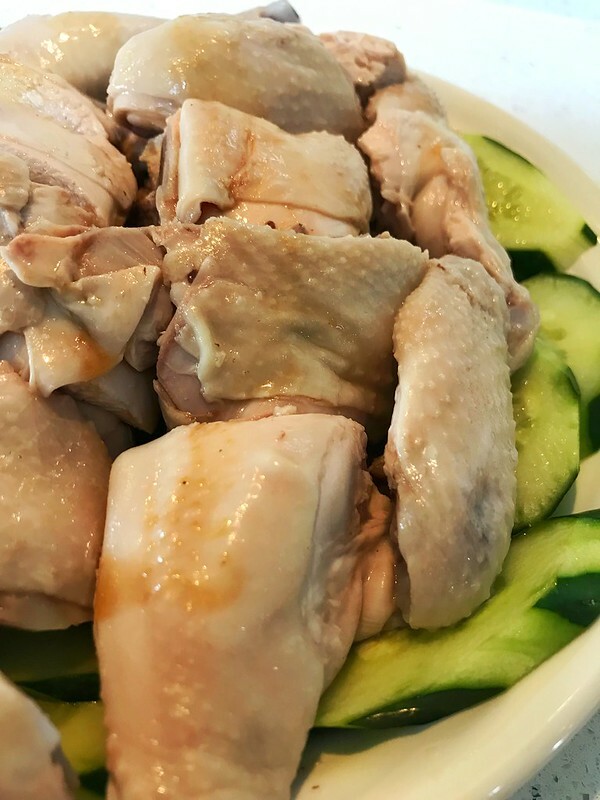 The Hainanese Chicken shares the same cooking recipe with this “cold chop chicken”, with extra Pandan leaves, instead of star anis, to insert inside the chicken’s stomach. Ideal size of chicken is about 800 gm to 1 kg with this timing (40 mins). Bigger size (1.3 -1.5 kg) needs longer timing (1 hour). 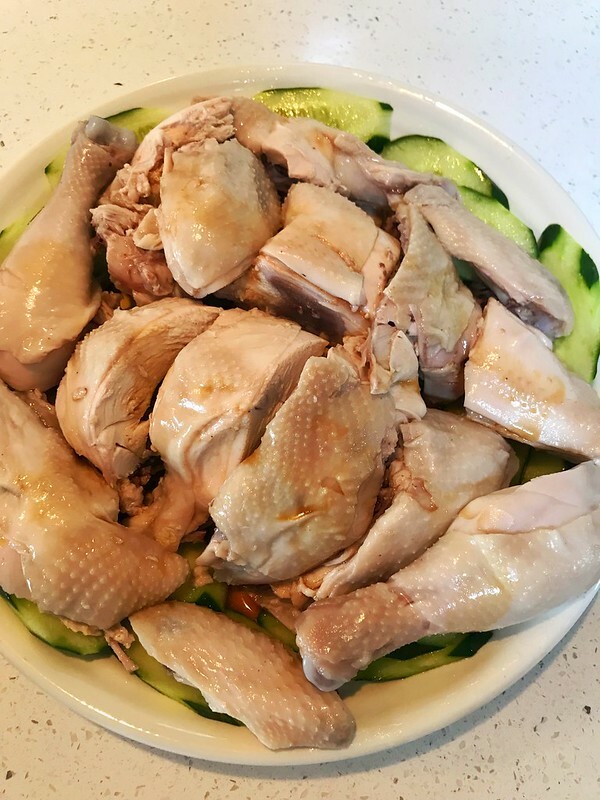 The purpose of Step 3: (Bath 3 times) is to ensure the boiling hot water reach the chicken internal to cook it evenly and properly. This is the area most likely still uncooked (hence with blood) while the external body is cooked much earlier. Step 5: soak in cold water makes the skin tightened, also not easily broken and peeled off from the body during cooking. Step 9: soak in icy water before cut is for the chicken meat and skin to shrink tightly. The pink color in the bones (but NO blood) indicates the most tender and juicy meat. It is the perfect cooked chicken.